sulcatus (Heptacondylus sulcatus n. sp., Mayr, 1862: 756, worker; original location given as "Cuba" but corrected by Mayr, 1893: 195) from South Africa, Port Natal - no images on Antweb (September 2016). Removed to new status as species: Myrmicaria taeniata (Santschi, 1930d: 269, worker) from Zaïre. The distinguishing features that readily separate it from the accepted M. natalensis workers are: the greater number of fine longitudinal striations on the face; the relatively pale scapes with almost no longitudinal striae; the longitudinal striae on the promesonotum reaching right to the anterior; the fine but clear spiculate sculpture on the base of the gaster (contrary to Santschi's statement). F Smith's (1858b) description is at . 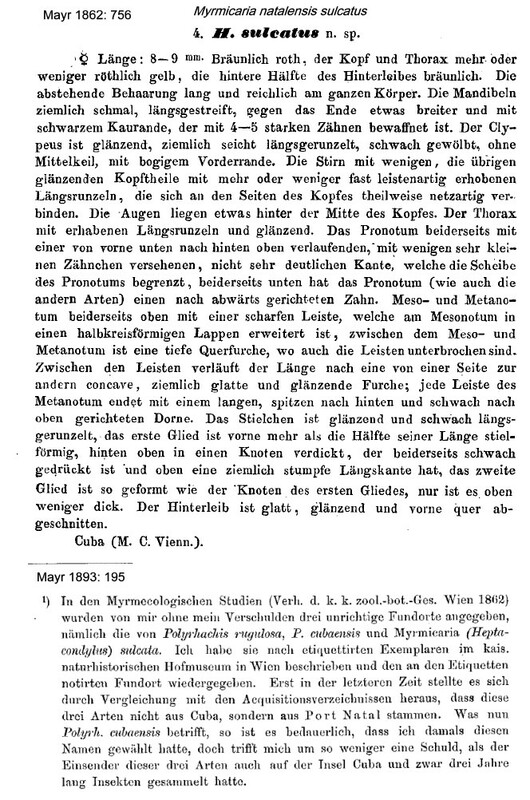 Gerstäcker's (1859) brief description of the eumenoides queen is at . Mayr's (1862) description of sulcatus is at . Mayr's (1866b: 906) description of the eumenoides worker is at . Arnold (1916: 263 ff) translation and notes on eumenoides (all forms) is at and . 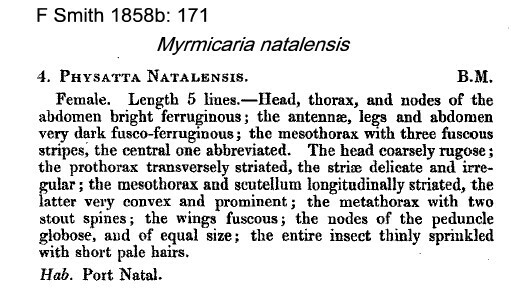 Santschi's (1930b) description of nigriventris is at . 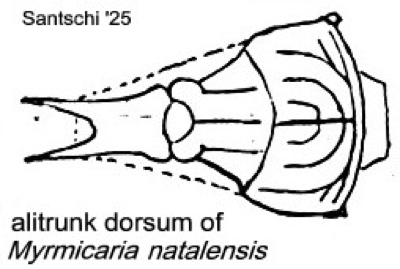 Santschi's (1937d) description of obscuriceps is at . Santschi (footnote on 1920i: 2) noted verticalis as differing from the type (striata) by the petiole node having similar faces to the anterior and posterior and closer to the shape of eumenoides. The photomontage of a (presumably F Smith) "syntype" queen is collated from http://www.antweb.org/specimen.do?name=casent0900501. F Smith (1858b) gave the colour as head, alitrunk and nodes bright ferruginous; antennae, legs and gaster very dark fusco-ferruginous. The photomontage of the (presumably) type queen of eumenoides is collated from http://www.antweb.org/specimen.do?name=focol1578. Although similar to the Smith syntype queen, this is some 120% larger (alitrunk length and HW, assuming scales accurate); has EI (EL/HL) 0.32, natalensis EI 0.26; possibly lighter coloured wings; appears to lack erect hairs on the gaster; and, has reticulate sculpture on the frons lateral to the eyes (simply striate on natalensis). The damaged nature of both queens makes it difficult to be sure. 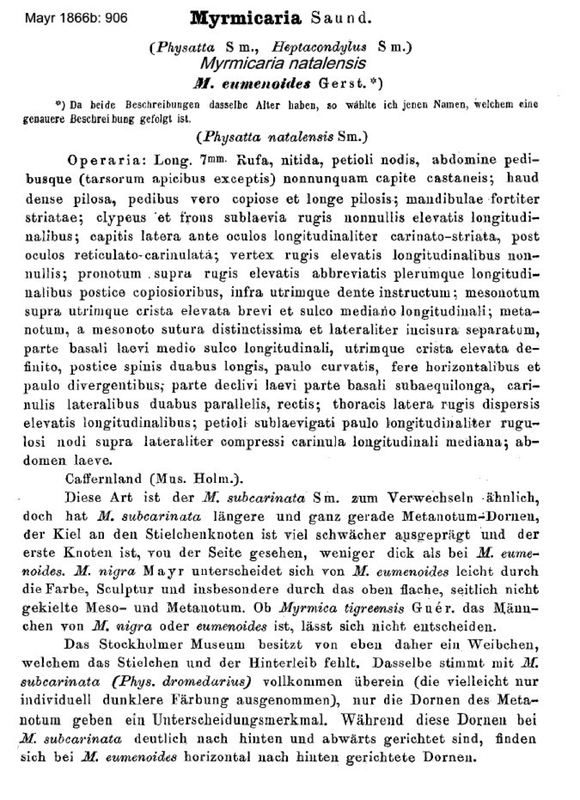 It is listed on Antweb as "type of Physatta natalensis", the Gerstaecker (1859) paper was on insects collected by Peters. This, therefore, is the queen of Heptacondylus eumenoides. 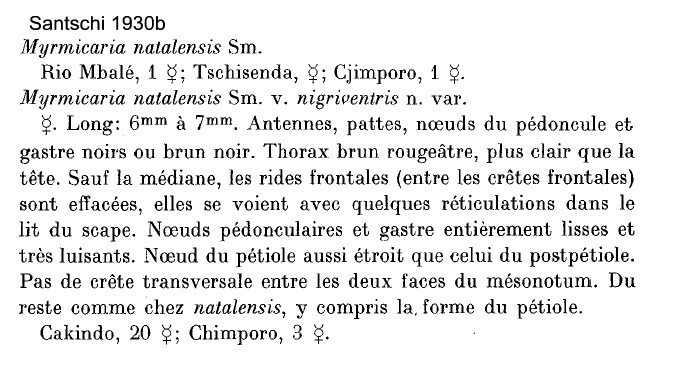 As Emery's (1922e) catalogue entry shows (below), there was no published work to associate natalensis and eumenoides. Mayr (1866b: 906) listed Physatta natalensis Sm. in brackets under the M. eumenoides title but gave no evidence to suggest why he associated the workers he described with the queens of Gerstaecker and F Smith. Emery (1893e: 219ff) had notes on the Indian species Myrmicaria fodica (as M. fodiens) which had eumenoides as a race; this is at . 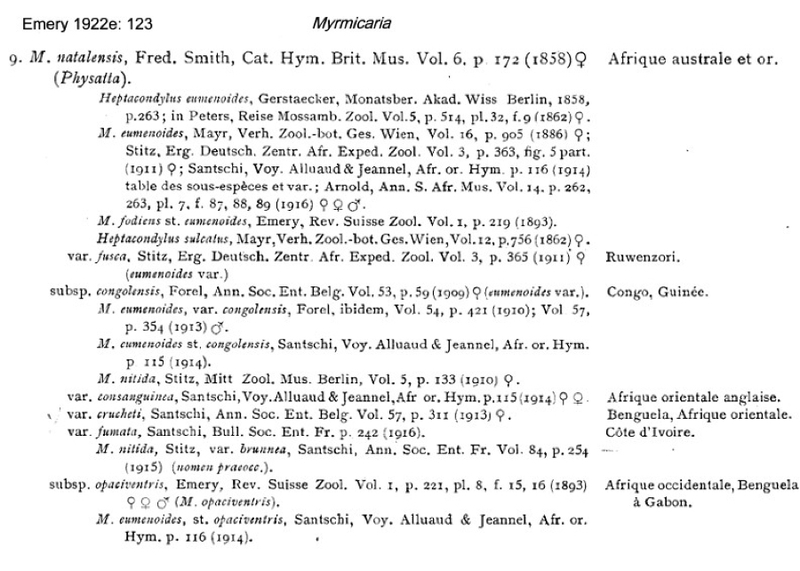 In his notes, Emery specifically states the "Heptacondylus sulcatus" described by Mayr (1862) and Mayr's (1866b) worker of M. eumenoides (from Cafferland not Mozambique) did not differ from those of Gerstaecker. Emery, however, as with Mayr (1862) either ignored the facts or knew of otherwise unreported specimens of workers associated with Gerstaecker's queen. Emery (1893e) described examining numerous examples from Basutoland (Lesotho) and Natal, collected by the missionary J. Weitzecker and refers to the inconstant characters of eumenoides in having a clypeus without a median carina but with rugae. He gave eumenoides as paler than fodica but with the gaster and legs black or dark brown, contrasting with the clear red of the head and alitrunk. The other authors had not mentioned the fine puncturation giving a matt appearance to the base of the gaster. Arnold (1916: 263) made no reference at all to natalensis but gave substantial notes on eumenoides. 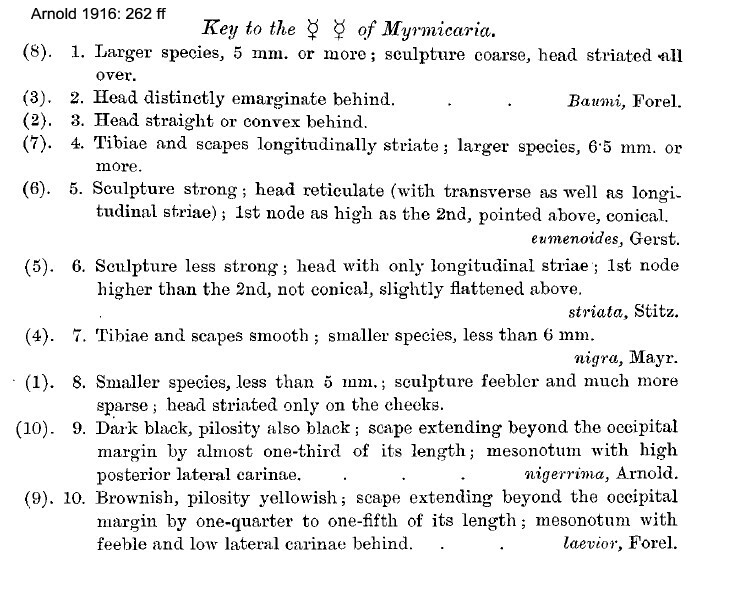 In his key to South African Myrmicaria, Arnold gave the note - "sculpture strong; head reticulate (with transverse as well as longitudinal striae; 1st node as high as the 2nd, pointed above conical"; . Santschi (1925c) used this species as his benchmark for separating and describing the species other than exigua (see below). He gave a full description of natalensis and explained how he had specimens from a single collection that had sexual and workers together; this is at . Under the heading Heptacondylus sulcatus Mayr (1863), Santschi described how he had examined a specimen of Heptacondylus eumenoides from the original Gerstaecker material, sent to him (Santschi) by Stitz from the Museum of Berlin. He felt the queen exactly matched the Smith description, so verifying the Emery (1922) synonymy. Turning back to the Mayr (1863) description of H. sulcatus workers, Santschi said he possesed a queen from Mozambique, plus one from Natal. The latter was collected with workers and a queen, so enabling him to be confident on the worker-queen relation. WORKER - TL 5.5-7 mm. Colour a variable reddish -brown. Gaster chestnut-brown often darker than thorax. Antenna and tarsi of an intermediate brown. Erect pilosity reddish-brown, fairly long but inequal and quite abundant on body and appendages. A central ridge runs the full length of the face to the cervical border. The central area of the face feebly striated between the frontal carinae, smooth either side of the median at the level of the eyes. The transverse ridge of the vertex is unique, sharp and anastomoses (links) the rugae on the vertex, those continuing to diverge on the occipitum. These rugae are moderately spaced and the spaces are smooth. The cheeks have several longitudinal rugae which continue in the area of the scape (scrobe?) inclining inside with little anastomosis. The sides of the head are finely striate longitudinally with a variable shiny area towards the inferior border. Promesonotum with a strong median carina, more pronounced on the anterior of the pronotum where it is traversed at right-angles by one to three arched rugae which become near parallel on the sides of the dorsum. The median carina reaches a posterior transverse carina which separates the dorsal and posterior faces of the mesonotum. The bordering ridges of the mesonotum are slightly prolonged forward on to the pronotum with a similarly sized smooth space between them and the median carina. The declivity of the mesonotum, the dorsum and declivity of the propodeum, the abdomen and the base of the gaster, plus the femora and tibia are smooth. The alitrunk sides have spaced and feeble longitudinal striae and the scapes and part of the tibiae are striated. Head slightly longer than wide, narrowing slightly anteriorly; sides near straight to the level of the eyes and arched posteriorly; the posterior margin near straight, with the occipital border markedly concave. Eyes convex and situated in the third quarter of the sides. Frontal carinae slightly sinuous with a well defined lobe. Anterior clypeal border straight with a strong median carina running more feebly on to the clypeus. Latter is convex, subcarinate and faintly striate on the sides. Mandibles densely striated, with 4 or 5 teeth. The antennal scape about one-third as long again past the occiput. Funiculus segments 1 and 3 subequal, segment 2 a quarter longer than its neighbours and as long as segment 5. Pronotum slightly convex transversely, moderate bordered in front and laterally by rugae. The promesonotal suture is well defined but shallow. Mesonotal lobes raised to appear as sills in profile. Mesonotum declivity is convex and higher anteriorly. Metanotal groove open before the basal lobes of the propodeum. The propodeal dorsum is twice as long as wide and one-third wider anteriorly, transversely concave the borders raised into low lobes in the anterior third. The length of the propodeal spines is about two thirds that of the propodeal dorsum and they continue in a horizontal plane with the dorsum; the spines are a little longer than their basal separation. The propodeal declivity is rectangular, flat and bordered. The petiole peduncle is arched, unarmed ventrally, a quarter long than the node. The node is as high as it is long, the anterior face steeper than the posterior and the posterior-superior angle is less acute than the anterior angle. Postpetiole slightly higher than petiole, profile more conical; ventral appendage limited and as straight as the petiole summit. Base of gaster truncated. Santschi also gave the following key to the subspecies of natalensis, and this seems to summarize the difference effectively. With the availability of most of the type images and the fresh specimens shown below, my feeling now (October 2014) is that most of the variation perceived by Santschi owes itself simply to size variations in what is a polymorphic species (see the Botswana specimens). Santschi (1930d) had taeniata n. var. as - "worker - brown ochre or light reddish, vertex and gaster darker brown, gastral tergites with a brown border; frons of head with denser rugae similar to eumenoides; pedicel nodes and gaster smooth; like irregularis but with eumenoides pedicel nodes. Zaïre, Katanga, Dr Staffers. Santschi (1939b: 238) simply noted that he established Myrmicaria natalensis st. obscuriceps from Southern Rhodesia (Zimbabwe) Bembeisi, 14.ii.1928, 4 workers, for the form shown by Arnold (1924, Plate VII, as M. striata, i.e. with the postpetiole much lower than the petiole. It should be noted the TL of sulcatus, from Port Natal, was given as 8-9 mm by Mayr (1862) and that of eumenoides was given as 8-9 mm by Lévieux (1983a). Those shown below from South Africa are in that larger size range. 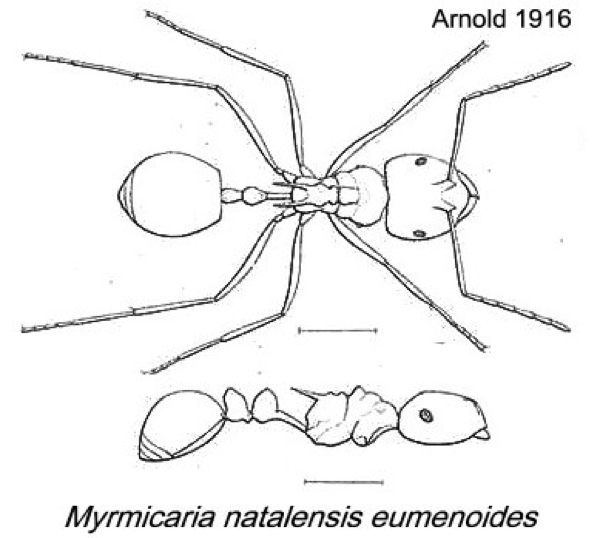 The measurements given by Lévieux (1983a) may, however, be of the (now) separate species Myrmicaria taeniata, see my note and page link above. 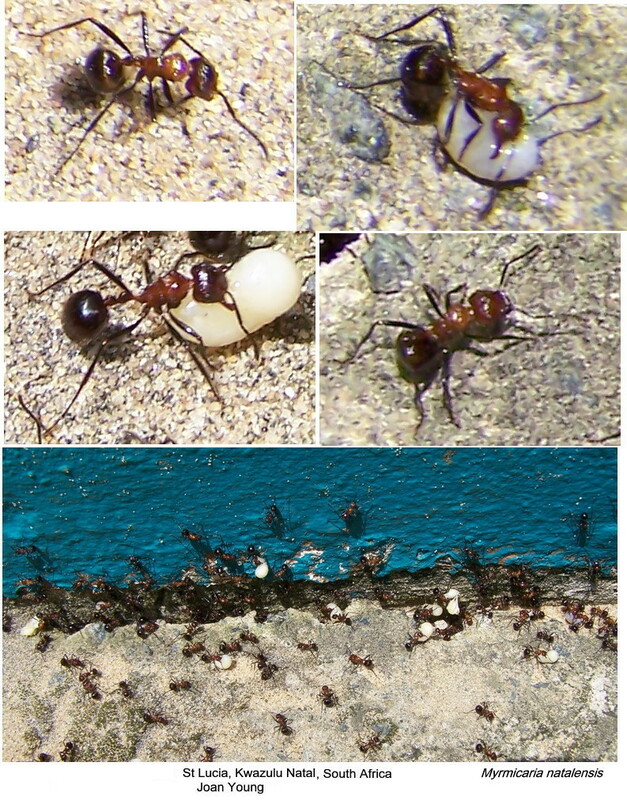 The photomontage of the verticalis type worker is collated from http://www.antweb.org/specimen.do?name=casent09130491. The photomontage of the navicula type worker is collated from http://www.antweb.org/specimen.do?name=casent0913045. The photomontage of the obscuriceps type worker is collated from http://www.antweb.org/specimen.do?name=casent0913047. 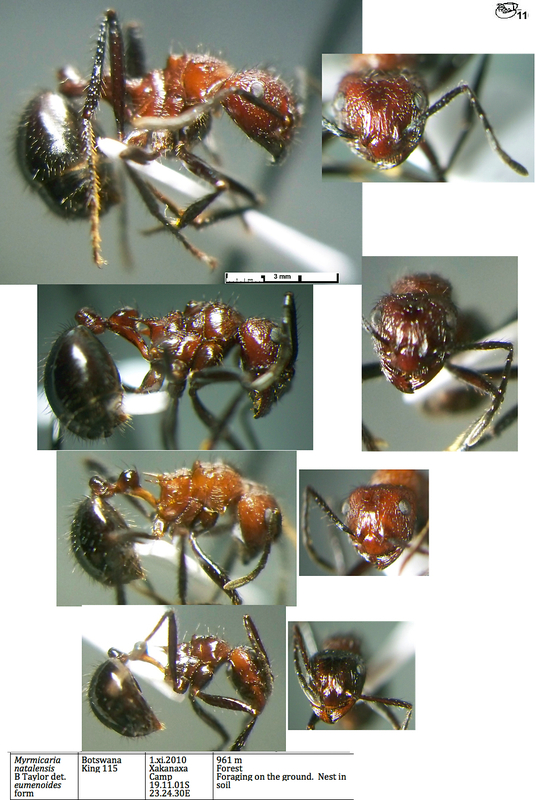 The photomontage of the nigriventris type worker is collated from http://www.antweb.org/specimen.do?name=casent0913047. The photomontage is of a worker from Mpumalanga, South Africa, Sabie env. ; collector Peter Hlavác. Apart from the paler colour this matches the Arnold (1916) translation (or modified description). It is bigger than but otherwise matches the type form as described by Santschi (1925c), see above. It also matches the navicula and obscuriceps images on Antweb (link above). The contrasting dark scapes seem diagnostic. The Antweb images of nigriventris and navicula (see link above) match the size, form and colour of the minima from Botswana. Similarly the obscuriceps images match the Botswana media 2. The specimens in these field photographs were taken in St. Lucia, Kwazulu, Natal, South Africa, by Joan Young; nos 101_2909 to 2911.